I’ve made a mushroom mousse, or a custard, several times in the last year or so. But I invited a vegan friend to lunch recently, and thought that it would be a great thing opportunity to develop a vegan version, mixed with some of the autumn flavours I really love. All I had to do was to get the mousse sorted out. I decided to take a combination of approaches. I figured I would use aquafaba - chick pea water - to provide some light moussiness (I am aware that’s probably not a word). As you probably know, you can whip chick pea water as if it was egg white and it will give you a whipped finish pretty indistinguishable from that you would get from eggs. I’ve done this for chocolate mousse in the past, but of course the chocolate is a key setting ingredient in that. To make up for its absence, I added 2 teaspoon of agar agar. You have to let the mushroom mixture cool right down before folding it into the whipped aquafaba - unlike egg, heat will knock all that precious air out and leave you with not very much. Otherwise, it’s all pretty straightforward. For me, this dish works because the smoothness of the mousse plays against the spicy textures of the autumn vegetables. 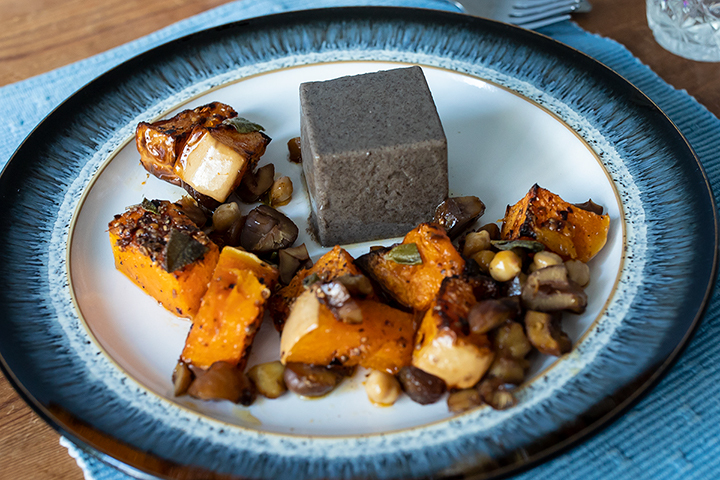 And I like it because the mushroom mousse becomes the hero of the dish - vegan food can be as tasty as any, but very often tends to the ‘lots of stuff mixed together on the plate’ model, rather than a lead component that becomes the centrepiece. This definitely provides that. You’ll see in the picture, I got all fancy with the mousse and did it in a square mould (inspired by Amanda Cohen of Dirt Candy - her mousse is fabulous and rich but decidedly NOT vegan). Great fun, but would probably do it in a standard shape in future - just easier all round to plate up. Heat the oil over a medium high heat, and add the white onion. Gently sauté for a few minutes until the onion begins to soften but not colour. Add the chopped mushrooms and continue to cook, stirring occasionally until the mushrooms have released their liquid, and most of it has boiled off. Add half of the almond milk and season with salt and pepper and cook for another couple of minutes, then remove from the heat and allow it to cool slightly. Once it’s cooler, blend it. If the mixture is too thick, add the remaining almond milk bit by bit until it just flows in the blender. Taste and add a little more salt if required (having it well seasoned is ideal, because it will be added later to the whipped aquafaba). Once it’s smooth, push through a sieve into a clean bowl and reserve. It needs to have completely cooled down before the next step. Put 20ml water in a small pan with the agar agar and bring to the boil. Whisk until the agar agar has dissolved (add a little more water if needed). Once it is dissolved, pour into the mousse mixture and whisk it in. Whisk the aquafaba in another bowl until it is forming soft peaks. Take about a third of this mixture and mix it vigorously into the mushroom to lighten it. Then fold in the rest using a spatula. It will take a while for it to become fully incorporated, but be patient and gentle. Once it’s fully incorporated, spoon the mushroom mousse into moulds that have been very lightly oiled and put into the fridge to set for about three hours. Preheat the oven to 180ºC (160ºC fan oven). Top and tail the butternut squash, and chop into chunks - removing the seeds. Drizzle a good slug of oil oil into the pan, add the squash and move it around so that all of it becomes fully coated by the oil. Bash the coriander seeds, the crushed chillies, the salt and pepper in a pestle and mortar and then scatter the spice and seasoning mix evenly over the squash. Put the pan in the oven for 30 minutes. Just before the end, chop the cooked chestnuts into large-ish chunks, and lightly chop the sage leaves. Mix them together, along with the chick peas. After the 30 minutes have passed, remove the squash from the oven, scatter the chestnut / sage / chick peas over them and put back in the oven for 10 minutes. To serve, unmould a mousse onto each plate. Accompany with the spicy squash mix.